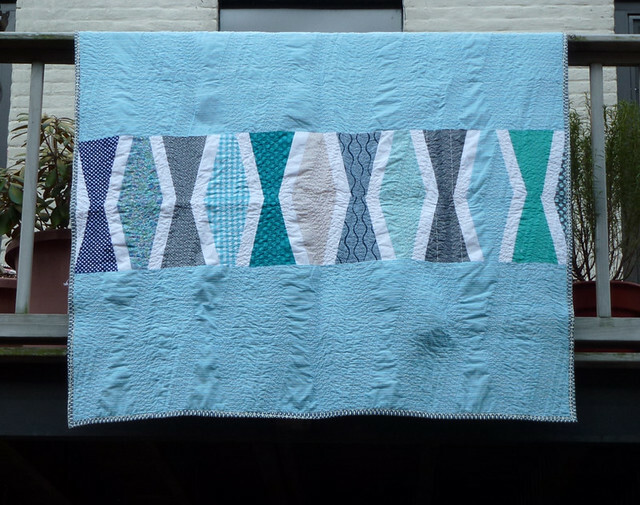 The first quilt I finished was made up of hourglass blocks. I pieced them all over the summer on my Singer 66, and then they sat, and sat, and sat over the fall, because I didn’t have time to finish it until the semester was over. But now it’s done! 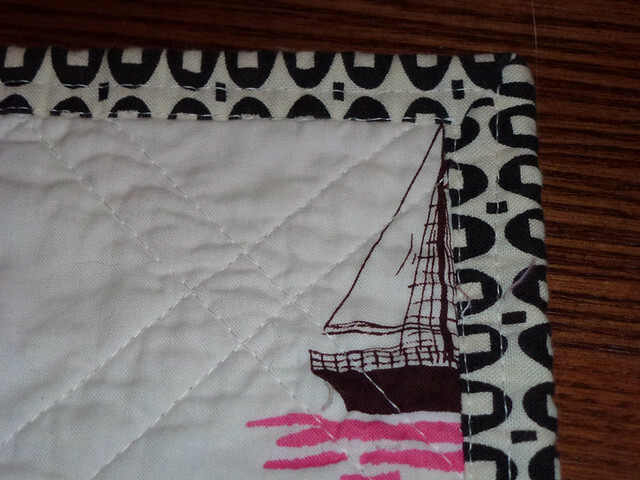 The backing is a boat print, because the mother and the grandparents all sail. 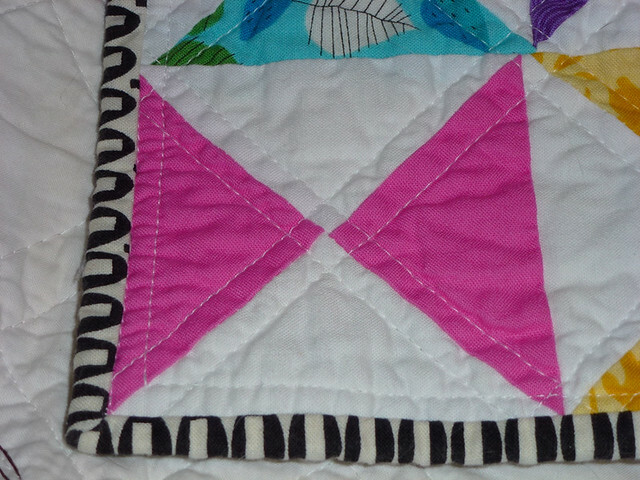 You can see in this picture that I quilted a simple diagonal grid 1/4″ on each side of the hourglass blocks. 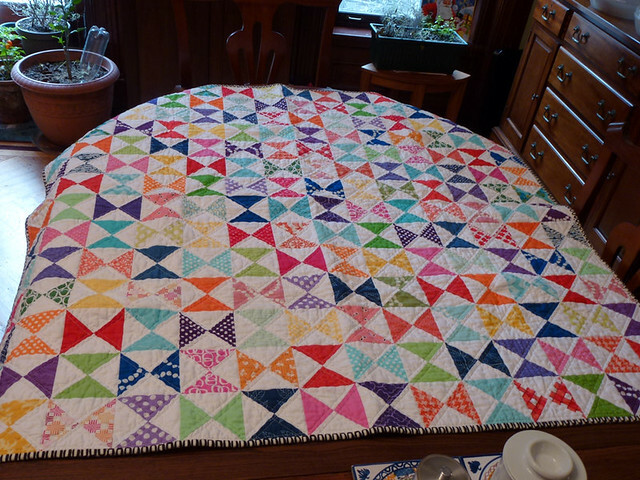 The other quilt is for friends of mine, because they live in northern England and it gets coooooold! 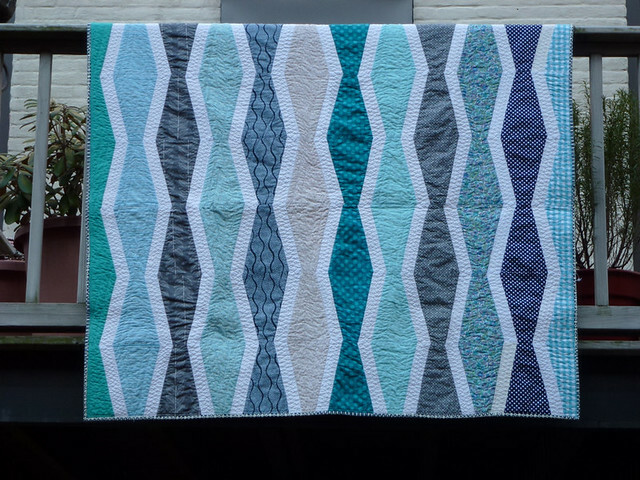 For this one I used a pattern by Elizabeth Hartmann: her New Wave Quilt. 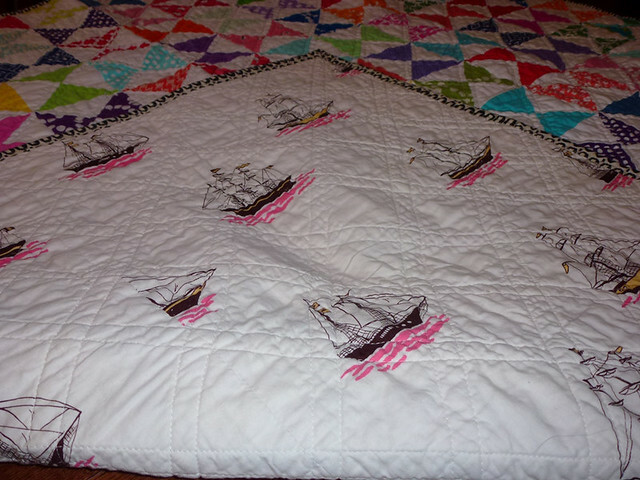 This one I quilted by stitching in the ditch along the edges of the white sashing. I stitched smaller diamonds within the “waves” as well. 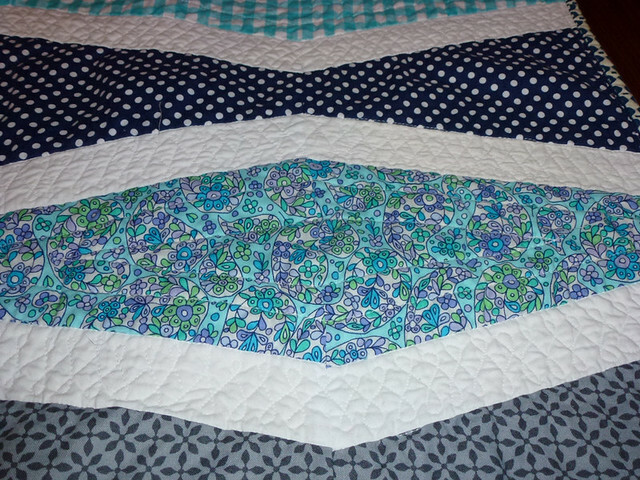 Then I did some free-motion quilting in the sashing, which I’m really quite proud of. 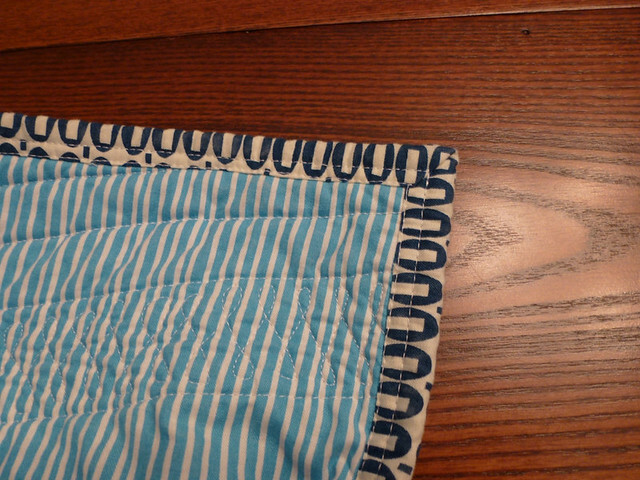 I did the same kind of binding on this quilt, and also bound it in a pezzy print, though this one was navy, to complement the blues of the quilt. Not bad for a break that only started on December 23rd! Wow, you’ve been productive! 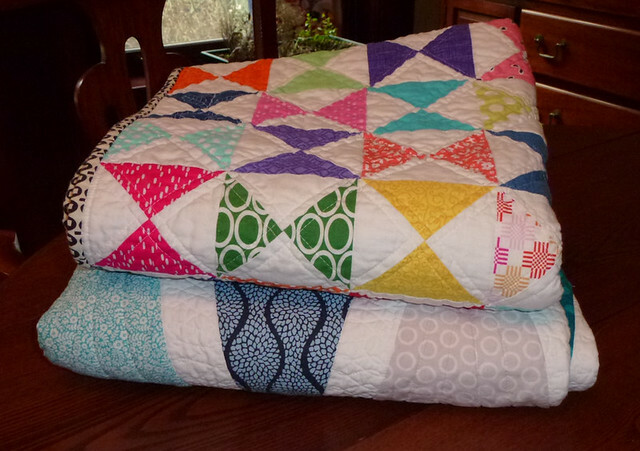 I love those quilts – great colour! Especially love that you used pezzy for the binding — great idea! Love your quilts! Two finishes, congratulations! The FMQ is lovely. Both quilts turned out lovely. I like the idea of having the backing fabric be something special to the folks you are giving the quilt to. Nice touch. Previous Previous post: A three-finish Friday! Next Next post: Housebound? Handspinning time.